Via the rope and load to ground. Fortunately, there were no fatalities, but a worker (dogman handling load) received a severe electric shock and was hospitalised with burns. Via the rope and crane which then jumped across to the nearby truck and then to the ground. Significant damage was sustained by the equipment. Auckland Cranes was tasked with installing precast concrete panels on the construction site in Te Atatu, South Auckland. The crane operator and truck driver (both in cabs) were unharmed, but the dogman handling the load received a severe electric shock and sustained burns to his lower legs. Emergency protocols were followed, and first aid was administered on site while an ambulance was called so that the injured worker could be taken to hospital for further treatment. In this particular incident, all other workers escaped injury. The equipment and vehicles on site, however, sustained significant damage. The earthed electricity caused damage to Transpower’s assets, the crane and the panel transportation truck and trailer; the tyres, electronics and lights were blown out on both vehicles. Repair costs were significant. Investigations began immediately after the incident occurred. Auckland Cranes performed a thorough internal investigation alongside external investigations from Transpower, WorkSafe NZ, and others. After an extensive investigation, WorkSafe announced they would not take any further action at that time. Auckland Cranes’ internal investigation has led to several lessons learned within the organisation. It is important to understand the potential consequences of an event like this. A crane coming into contact with high-voltage lines is often complicated by the fact that electrical isolations are required, meaning there could be a significant wait time (up to 3 hours) before emergency services can approach to assist and rescue. Also, because electricity can be conducted through the earth, it is not just the crane operator or those directly under the power lines who are at risk. Anyone in the immediate area can still receive a shock, especially if standing with feet apart or walking. In such circumstances, it is best to quickly “shuffle” away from the area with small steps. The potential consequences of these events can be frightening. But, the good news, there are organisations out there to provide advice and ample information on addressing electrical hazards. 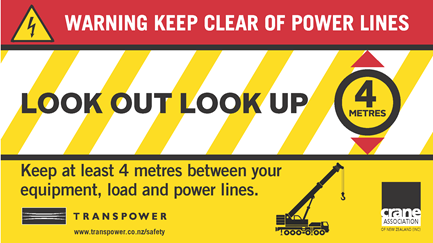 The formal advice from Transpower in New Zealand is to keep at least 4 metres between your equipment, boom, load and power lines at all times. Any mobile equipment operating near power lines is required to carry a warning notice in a location visible to the operator. If you are in New Zealand and in any doubt, contact Transpower Landowner Liaisons for your area (Google Transpower Landowner Liaison contacts). Transpower is working with local councils to minimise further build under overhead power line corridors, to eliminate the need for contractors to work under or near overhead power lines. Note, the safe working distance from power lines varies from state to state and between countries. Therefore, it is recommended you contact your local electricity provider for advice on your specific site circumstances.